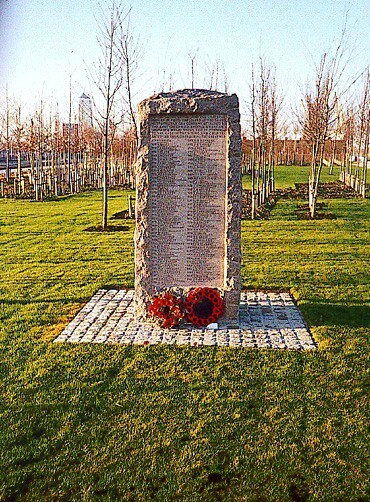 The South Metropolitan Gas Workers World War 1 memorial is near the Dome in Greenwich in Millennium Complex Central Park, John Harrison Way, Greenwich. It takes the form of a free standing, tall, rectangular, rough hewn stone with a smooth face bearing the inscription and names. It originally stood in British Gas South-Eastern Works, Port Greenwich but when this site was re-developed for the Millennium Project it was resited and rededicated. There are 79 names in all with surname, initial, rank and service details. It was originally dedicated by the Bishop of Southwark 18th September 1926. SACRIFICED THEIR LIVES IN THE GREAT WAR. Stoker 1st Class 296903, (RFR/CH/B/3469) Hood Battalion, Royal Naval Division, Royal Navy. Died 6th May 1915. Aged 36. Son of Benjamin Ansell; husband of Mary Jean Ansell, of 64, Friendly St., St. John's, Deptford, London. Served in the South African War. No known grave. Commemorated on HELLES MEMORIAL, Turkey. Panel 1 and 2. Rifleman 4925, 1st/6th (City of London) Battalion (Rifles), London Regiment. Killed in action 22nd October 1916. Aged 20. Born Battersea, enlisted London, resident Forest Hill. Son of William and Mary Ann Bailey, of "Antrim," The Glen, Minster, Sheppey, Sheerness. No known grave. Commemorated on YPRES (MENIN GATE) MEMORIAL, Ieper, West-Vlaanderen, Belgium. Panel 54. Private G/9164, 11th Battalion, Queen's Own (Royal West Kent Regiment). Died 8th February 1917. Aged 20. Born Greenwich, enlisted Deptford, S.E. Son of Edward Albert and Hannah Maria Barkwith, of 1, Trinity Grove, Blackheath Hill, London. Buried in GIAVERA BRITISH CEMETERY, ARCADE, Italy. Plot 2. Row A. Grave 11. Private G/644, 6th Battalion, The Buffs (East Kent Regiment). Killed in action 13th October 1915. Aged 31. Born Camberwell, Surrey, enlisted Greenwich, resident East Greenwich. Son of the late George and Polly Beard. No known grave. Commemorated on LOOS MEMORIAL, Pas de Calais, France. Panel 15 to 19. [Listed on memorial as Driver] Private DM2/134920, 906th Motor Transport Company, Royal Army Service Corps. Died in Egypt 22nd October 1918. Aged 37. Born Monmouth. enlisted St Pancras, resident East Greenwich. Son of Evan Bennett; husband of A. E. Bennett, of 17, Grenfell St., Greenwich, London. Buried in HAIFA WAR CEMETERY, Israel. Plot/Row/Section A. Grave 24. [Listed as Private & 5th Battalion on memorial] Rifleman S/7998, 12th Battalion, Rifle Brigade (The Prince Consort's Own). Died of wounds 6th October 1915. Aged 26. Born Stepney, Middlesex, enlisted Deptford, resident Peckham, Surrey. Son of Sarah Ann Bodley, of 87, Astbury Rd., Peckham, London. Buried in LONGUENESSE (ST. OMER) SOUVENIR CEMETERY, Pas de Calais, France. Plot II. Row A. Grave 49. [Listed as Private on memorial] Rifleman 2216, "B" Company, 1st/6th (City of London) Battalion (Rifles), London Regiment. Killed in action 25th September 1915. Aged 20. Enlisted London, resident East Greenwich. Son of William George and Catherine Mary Boulton, of 2, Christ Church St., Greenwich, London. No known grave. Commemorated on LOOS MEMORIAL, Pas de Calais, France. Panel 130. [Listed as Rifleman on memorial] Lance Corporal S/9903, 7th Battalion, Rifle Brigade (The Prince Consort's Own). Killed in action 10th April 1917. Born and resident Greenwich, enlisted Poplar, Middlesex. Son of Edward and Harriett Eliza Bradford, of 46, Ordnance Rd., Tunnel Avenue, East Greenwich, London. Buried in TIGRIS LANE CEMETERY, WANCOURT, Pas de Calais, France. Plot I. Row E. Grave 4. Acting Corporal G/13857, 1st/7th Battalion, Duke of Cambridge's Own (Middlesex Regiment). Killed in action 3rd May 1917. Aged 26. Born and resident Charlton, enlisted Woolwich. Son of Edmund and Mary Carter, of 248, Basingstoke Rd., Reading. No known grave. Commemorated on ARRAS MEMORIAL, Pas de Calais, France. Bay 7. Private 241187, 1st/6th Battalion, East Surrey Regiment. Died in India 31st October 1918. Aged 24. Born Weybridge, Surrey, enlisted Kingston-on-Thames, Surrey. Son of J. W. H. Carpenter and Mary Carpenter, of 5, Railway Terrace, Heath Rd., Weybridge, Surrey. Buried in Agra Cantonment Cemetery, India. Commemorated on MADRAS 1914-1918 WAR MEMORIAL, CHENNAI, India. Face 15. Stoker 1st Class K/25557, H.M.S. Vanguard, Royal Navy. Dieed 9th July 1917. Aged 39. Son of William Chapman, of White Hart, Sittingbourne, Kent. No known grave. Commemorated on CHATHAM NAVAL MEMORIAL, Kent. Panel 23. [Listed as CHETTER on SDGW and CWGC] Private 22754, 2nd Battalion, Grenadier Guards. Died of wounds 8th April 1918. Aged 41. Born Walworth, S.E., enlisted Deptford. Husband of Mrs. S. A. Chetter, of 18, Ordnance Rd., Tunnel Avenue, East Greenwich, London. Buried in BAC-DU-SUD BRITISH CEMETERY, BAILLEULVAL, Pas de Calais, France. Plot II. Row B. Grave 20. Stoker 1st Class K/25560, H.M.S. Vanguard, Royal Navy. Died 9th July 1917. Aged 35. Son of Mr. and Mrs. R. Coates, of East Greenwich; husband of H. Coates, of 33, Collerston Rd., East Greenwich, London. No known grave. Commemorated on CHATHAM NAVAL MEMORIAL, Kent. Panel 23. Private 54097, 1st/5th Battalion, Prince of Wales's Own (West Yorkshire Regiment). Died of wounds 12th October 1918. Born Kedington, Suffolk, enlistd and resident Greenwich. Son of Mrs. J. Sargeant, of 41, Blackley Buildings, East Greenwich, London. Buried in NAVES COMMUNAL CEMETERY EXTENSION, Nord, France. Plot V. Row A. Grave 3. [Listed as Private on memorial] Lance Corporal F/670, 17th Battalion, Duke of Cambridge's Own (Middlesex Regiment). Killed in action 28th July 1916. Aged 33. Born Gillingham, Kent, enlisted Deptford, resident Greenwich. Husband of Eliza Collett, of 264, Pier Rd., Gillingham, Kent. Buried in DELVILLE WOOD CEMETERY, LONGUEVAL, Somme, France. Plot VII. Row L. Grave 3. Major, 6th (City of London) Battalion (Rifles), London Regiment. Killed in action 20th May 1917. Aged 36. Son of George and Eliza Ellen Collins, of 29, Glenluce Rd., Blackheath, London. Buried in MORY ABBEY MILITARY CEMETERY, MORY, Pas de Calais, France. Plot I. Row I. Grave 4. Rifleman 57538, 2nd Battalion, King’s Royal Rifle Corps. Killed in action 17th October 1918. Aged 32. Born Cambridge, enlisted Housnlow, Middlesex, resident East Greenwich. Son of Mrs. Cornell, of 24, Cowper Rd., Cambridge; husband of Christiana May Slater (formerly Cornell), of 5, North Kent Grove, Woolwich, London. No known grave. Commemorated on VIS-EN-ARTOIS MEMORIAL, Pas de Calais, France. Panel 9. Private 630885, 20th (County of London ) Battalion (Blackheath and Woolwich), London Regiment. Killed in action 7th June 1917. Enlisted Blackheath, resident Greenwich. No known grave. Commemorated on YPRES (MENIN GATE) MEMORIAL, Ieper, West-Vlaanderen, Belgium. Panels 52 to 54. Private 43410, 17th Battalion, Manchester Regiment. Killed in action 7th May 1918. Born Hove, Sussex, enlisted Woolwich, resident Greenwich. Formerly G/8203, Royal Sussex Regiment. No known grave. Commemorated on TYNE COT MEMORIAL, Zonnebeke, West-Vlaanderen, Belgium. Panel 120 to 124 and 162 to 162A and 163A. Lieutenant, Royal Air Force and Middlesex Regiment. Killed 9th May 1918. Aged 26. Son of Benjamin and Beatrice Gliddon, of Plumstead. Buried in PLUMSTEAD CEMETERY, London. Sction K. Grave 2397. Private D/17016, 7th Dragoon Guards (Princess Royal's). Died of wounds 26th March 1918. Aged 19. Born Exeter, Devon, enlisted Woolwich, resident Greenwich. Son of Harry and Elizabeth Ellen Golding, of 4, Mauritius Rd., East Greenwich, London. Buried in ST. SEVER CEMETERY EXTENSION, ROUEN, Seine-Maritime, France. Section P. Plot VI. Row H. Grave 6A. [Listed as GOODGER on SDGW & CWGC] Sergeant 43642, 15th/17th Battalion, Prince of Wales's Own (West Yorkshire Regiment). Killed in action 27th March 1918. Born Faversham, enlisted Woolwich, resident East Greenwich. Formerly 31890, Royal Scots Fusiliers. Buried in MOYENNEVILLE (TWO TREE) CEMETERY, Pas de Calais, France. Plot/Row/Section B. Grave 12. [Spelt GREENWAY on SDGW & SDGW] Private 325034, "A" Company, 1st/8th Battalion, Royal Warwickshire Regiment. Killed in action 27th August 1917. Aged 35. Born Long Handborough, Oxon, enlisted Kington-on-Thames, Surrey, resident Wimbledon, Surrey. Son of Mrs. Greenway, of 1, Crown Lane, Morden, Surrey; husband of Ada Emily Greenway, of 11, William Rd., Wimbledon. London. Formerly 6434, Suffolk Regiment. No known grave. Commemorated on TYNE COT MEMORIAL, Zonnebeke, West-Vlaanderen, Belgium. Panel 23 to 28 and 163A. Rifleman R/42933, 9th (queen Victori's Rifles) Battalion, London Regiment attached to 16th Battalion, King's Royal Rifle Corps. Killed in action 23rd August 1918. Born and resident Greenwich, enlisted Chelsea. Buried in BEACON CEMETERY, SAILLY-LAURETTE, Somme, France. Plot VI. Row I. Grave 4. Rifleman S/20895, 10th Battalion, Rifle Brigade (The Prince Consort's Own). Died of wounds 21st February 1917. Born Worthing, Sussex, enlisted and resident Greenwich. Buried in BEACON CEMETERY, SAILLY-LAURETTE, Somme, France. Special Memorial 4. Note: The cemetery now contains 501 Commonwealth burials and commemorations of the First World War. 28 of the graves are unidentified but special memorials are erected to seven soldiers known to be buried among them. Another special memorial commemorates a soldier buried by the Germans in Cauroir Communal Cemetery, whose grave could not be found. [Listed as Pioneer on memorial] Private 11462, 2nd Battalion, Hampshire Regiment. Killed in action 2nd October 1918. Aged 41. Born Highgate, enlisted Lewisham. Son of Mr. and Mrs. Hastings, of Lewisham; husband of Mrs. F. M. Hastings, of 16, Vian St., Lewisham, London. Awarded the Military Medal (M.M.). Buried in DUHALLOW A.D.S. CEMETERY, Ieper, West-Vlaanderen, Belgium. Plot VII. Row E. Grave 27. Sergeant F/860, 17th Battalion, Duke of Cambridge's Own (Middlesex Regiment). Died of wounds 23rd November 1917. Aged 32. Born Greenwich, enlisted Deptford, resident Charlton. Son of Thomas and Mary Ann Hayes, of 24, Ormiston Rd., Greenwich; husband of Elizabeth Woodmore (formerly Hayes), of 22, Ormiston Rd., East Greenwich, London. Buried in CAHRLTON CEMETRY, Greenwich, London. Plot/Row/Section L. Grave 171. Stoker 1st Class SS/108171, H.M.S. Itchen, (RFR/CH/B/10440). H.M.S. Itchen, Royal Navy. Died 6th July 1917. No known grave. Commmeorated on CHATHAM NAVAL MEMORIAL, Kent. Panel 24. Acting Lance Corporal P/749, Military Mounted Police, Military Police Corps. Killed in action 2nd May 1916. Aged 31. Born Fakenham, enlisted Woolwich, resident Blackheath. Husband of Isabella Hill, of 28, Ruthin Rd., Westcombe Park, Blackheath, London. Formerly 5913, Lancers of the Line. Buried in BULLY-GRENAY COMMUNAL CEMETERY, BRITISH EXTENSION, Pas de Calais, France. Plot I. Row A. Grave 3. [Listed as Private on memorial] Lance Corporal G/6240, 3rd Battalion, Queen's Own (Royal West Kent Regiment). Died in United Kingdom 26th March 1916. Aged 39. Born Faversham, enlisted Deptford, resident Charlton. Son of Mr. and Mrs. Benjamin Hills, of 6, Priory Rd., Dovington, Faversham. Buried in FAVERSHAM BOROUGH CEMETERY, Faversham, Kent. Plot/Row/Section L. Grave 552. [Listed as R H IZZARD on memorial] Private 34031, 15th Battalion, Royal Warwickshire Regiment. Killed in action 30th August 1918. Aged 28. Born Peckham, enlisted Camberwell, resident Blackheath. Husband of Daisy E. Izzard, of 126, Westcombe Hill, Blackheath, London. Formerly 202197, East Kent Regiment. Buried in VAULX HILL CEMETERY, Pas de Calais, France. Plot I. Row D. Grave 9. [Spelt JESSUP on CWGC] Private G/119, 6th Battalion, Queen's OWn (Royal West Kent Regiment). Killed in action 8th October 1915. Born Hawling, Kent, enlisted Woolwich, resident Greenwich. No known grave. Commemorated on LOOS MEMORIAL, Pas de Calais, France. Panel 95 to 97. [Listed as 2nd Class on memorial] Air Mechanic 3rd Class 298286, Armament School (Uxbridge), Royal Air Force. Died 15th October 1918. Aged 18. Son of Frederick and Mary Ann Kelly, of 29, Houghton Rd., Charlton, London. Buried in NEW BRENTFORD CEMETERY, Middlesex. Grave reference F. E. 94. Sergeant F/616, 17th Battalion, Duke of Cambridge's Own (Middlesex Regiment). Killed in action 13th November 1916. Aged 37. Born Chatham, enlisted Deptford, resident Greenwich. Husband of Mary Kate Kington, of II, Croom's Hill, Greenwich, London. Buried in SERRE ROAD CEMETERY No. 1, Pas de Calais, France. Plort I. Row C. GRave 2. Private 13246, 8th Battalion, Princess Charlotte of Wales's (Royal Berkshire Regiment). Killed in action 25th September 1915. Born Bromley, enlisted Bow, Middlesex, resident Bromley-by-Bow. No known grave. Commemorated on LOOS MEMORIAL, Pas de Calais, France. Panel 93 to 95. Gunner L/20950, "B" Battery, 167th Brigade, Royal Field Artillery. Killed in 22nd July 1916. Aged 22. Enlisted Camberwell, S.E., resident West Greenwich, S.E. Son of the late Mr. W. J. and Mrs. E. J. Lawrence. No known grave. Commemorated on THIEPVAL MEMORIAL, Somme, France. Pier and Face 1 A and 8 A.
Corporal, East Kent Regiment probably Alfred LOVEDAY, Corporal G/24673, 6th Battalion, The Buffs (East Kent Regiment). Killed in action 18th March 1918. Born Woolwich, enlisted Whitehall, resident Edmonton. Buried in CITE BONJEAN MILITARY CEMETERY, ARMENTIERES, Nord, France. Plot VII. Row C. Grave 22. Gunner 15563, 138th Heavy Battery, Royal Garrison Artillery. Died of wounds 9th April 1917. Aged 32. Born Tivetshall, Norfolk, enlisted Harlesden, resident Mendham. Husband of F. Margetson, of 79, Commerell St., East Greenwich, London. Buried in BETHUNE TOWN CEMETERY, Pas de Calais, France. Plot VI. Row C. Grave 77. [Listed as 6th City of London on memorial] Private 51092, Labour Corps, The Queen's (Royal West Surrey Regiment) formerly London Irish Rifles. transf. to (81340). Died 3rd April 1919. Aged 30. Son of George Mayzes, of 2, Armitage Rd., East Greenwich; husband of late Florence Gibbs (formerly Mayzes), of 10, Wycliffe Rd., Battersea, London. Buried in MORDEN CEMETERY, Surrey. Grave reference: WB. 216. Sapper 67184, 69th Field Company, Royal Engineers. Killed in action 7th October 1915. Aged 36. Born Charlton, enlisted Dentford (sic), resident Greenwich. Husband of Annie Elizabeth Manners, of 24, Aldeburgh St., East Greenwich, London. No known grave. Commemorated on LOOS MEMORIAL, Pas de Calais, France. Panel 4 and 5. Private 54687, 2nd/4th Battalion, Hampshire Regiment. Died 19th November 1918. Aged 24. Son of Charles and Barbara Maries, of 69, Queen's Rd., Aldershot. B.Sc. (London); F.C.S. Buried in ETAPLES MILITARY CEMETERY, Pas de Calais, France. Plot L. Row E. Grave 14. Driver 8636, "D" Battery, 69th Brigade, Royal Field Artillery. Died 6th August 1915. Aged 22. Son of Mrs. Mary Ann Taylor, of 14, Lenthorp Rd., Greenwich, London. Buried in ALEXANDRIA (CHATBY) MILITARY AND WAR MEMORIAL CEMETERY, Egypt. Plot/Row/Section J. Grave 183. [Listed as 10th County of London Regiment] Private S/36484, 2nd/10th Rifle Brigade (The Prince Consort's Own) posted to 10th Battalion, London Regiment. Killed in action 7th September 1918. Aged 19. Born and enlisted Deptford, resident new Cross, Surrey. Formerly TR9/26265, Training Reserve. Son of Mr. W. R. and Mrs. A. B. Miller, of 160, Milton Court Rd., New Cross, London. Buried in PERONNE COMMUNAL CEMETERY EXTENSION, Somme, France. Plot V. Row L. Grave 11. Private 275069, 6th Battalion, Essex Regiment. Killed in action in Palestine 20th October 1917. Born and enlisted West Ham, resident Plaistow. Buried in BAGHDAD (NORTH GATE) WAR CEMETERY, Iraq. Plot XXI. Row V. Grave 18. [Listed as Sick Berth Attendant on memorial] Senior Reserve Attendant M/9706, H.M.S. Pembroke, Royal Naval Auxiliary Sick Berth Reserve. Died 5th June 1916. Aged 46. Husband of Ellen Rose Minchin, of 17, Gibson St., Greenwich. London. Buried in SHEPPERTON CHURCH CEMETERY, Middlesex. Grave 28. [Listed as Driver on SDGW] Gunner 197306, "A" Battery, 105th Brigade, Royal Field Artillery. Died of wounds 2nd October 1918. Enlisted Woolwich, resident East Greenwich. Formerly 12857, Horse Keeper, Royal Army Veterinary Corps. Buried in TINCOURT NEW BRITISH CEMETERY, Somme, France. Plot V. Row J. Grave 17. Rifleman R/35562, 1st Battalion, King’s Royal Rifle Corps. Killed in action 29th April 1917. Born Camberwell, Surrey, enlisted Woolwich, resident Greenwich. Buried in ORCHARD DUMP CEMETERY, ARLEUX-EN-GOHELLE, Pas de Calais, France. Plot V. Row F. Grave 1. Rifleman 46892, 13th Battalion, King’s Royal Rifle Corps. Died 4th November 1918. Aged 27. Son of Alexander and Sarah Ann Nowlan, of Poplar, London; husband of Selina Nowlan, of 68, Alexandra Rd., East Ham, London. Buried in BEAURAIN BRITISH CEMETERY, Nord, France. Plot/Row/Section B. Grave 4. Sergeant 31799, "A" Battery, 277th Brigade, Royal Field Artillery. Killed in action 9th July 1917. Aged 38. Enlisted Deptford, resident Peckham. Son of the late Capt. McGreivy (Mercantile Marine), and Mrs. McGreivy, of Maryport, Cumberland; husband of Lydia Elizabeth Phoebe McGreivy, of 11, Lugard Rd., Peckham, London. Served from 1899-1900 in the South African Canpaign, with the Naval Brigade on H.M.S. Monarch. Buried in POPERINGHE NEW MILITARY CEMETERY, Poperinge, West-Vlaanderen, Belgium. Plot II. Row D. Grave 22. Stoker 1st Class K/25565, H.M.S. Vanguard, Royal Navy. Died 9th July 1917. Aged 35. Son of John Beeching Omans and Emma Jane Omans of 11, Saxon Rd., Faversham, Kent; husband of Harriett Ellen Omans, of 43, Westcombe Hill, Blackheath, London. No known grave. Commemorated on CHATHAM NAVAL MEMORIAL, Kent. Panel 24. Private P.W.1427, 25th Battalion, Duke of Cambridge's Own (Middlesex Regiment). Died in United Kingdom 14th February 1916. Aged 47. Born Penge, enlisted Woolwich, resident Plumstead. Son of the late Mr. and Mrs. Parrington, of 9, Denmark Rd., South Norwood, London. Buried in CAMBRIDGE CITY CEMETERY, Cambridge. Plot/Row/Section D. Grave 2605. Private G/8055, 11th Battalion, Queen's Own (Royal West Kent Regiment). Killed in action 8th April 1917. Aged 32. Born Greenwich, enlisted Deptford. Son of Mrs. Emma S. Powell, of 71, Old Woolwich Rd., East Greenwich, London. Buried in DICKEBUSCH NEW MILITARY CEMETERY, Ieper, West-Vlaanderen, Belgium. Plot/Row/Section A. Grave 32. Corporal 291081, 702nd Company, Labour Corps transferred from 114709, Labour Company, Royal Engineers. Died 8th November 1918. Aged 44. Born Conger, kent, enlisted London, resident Greenwich. Husband of Elizabeth Sarah Ransley, of 35, Bellot St., East Greenwich, London. Buried in AWOINGT BRITISH CEMETERY, Nord, France. Plot III. Row B. Grave 3. Sergeant 1523, 1st/6th (City of London) Battalion 9Rifles), London Regiment. Killed in action 15th September 1916. Born and resident Greenwich, enlisted London. No known grave. Commemorated on THIEPVAL MEMORIAL, Somme, France. Pier and Face 9 D.
Lance Corporal G/6078, Middlesex Regiment. Died 27th February 1919. Buried in BROCKLEY CEMETERY, DEPTFORD, London. Commemorated on Screen Wall. Z. 307. Private 13780, 7th Battalion, King's (Shropshire Light Infantry). Died of wounds 15th July 1916. Aged 29. Born Deptford, enlisted Greenwich. Husband of Alice Maud Reed, of 29, Randal Place, West Greenwich, London. Buried in LA NEUVILLE BRITISH CEMETERY, CORBIE, Somme, France. Plot I. Row B. Grave 54. Private 3323, "A" Company, 20th (County of London) Battalion (Blackheath and Woolwich), London Regiment. Died of wounds 28th September 1915. Aged 21. Born Balham, Surrey, enlisted Blackheath, resident Hither Green. Son of Elizabeth Harriet Hooper (formerly Robertson), of 99, Broadfield Rd., Catford, London, and the late Henry James Robertson. Buried in NOEUX-LES-MINES COMMUNAL CEMETERY, Pas de Calais, France. Plot I. Row C. Grave 24. Private F/621, 23rd Battalion, Duke of Cambridge's Own (Middlesex Regiment). Killed in action 21st September 1917. Aged 32. Born Greenwich, enlisted Deptford. Husband of Maria Scammell, of 23, Church St., Deptford, London. No known grave. Commemorated on TYNE COT MEMORIAL, Zonnebeke, West-Vlaanderen, Belgium. Panel 113 to 115. Private 7606, 1st/6th (1st/9th on CWGC) Battalion (Territorial), Northumberland Fusiliers. Killed in action 13th November 1916. Enlisted Woolwich. Formerly 19757, East Surrey Regiment. No known grave. Commemorated on THIEPVAL MEMORIAL, Somme, France. Pier and Face 10 B 11 B and 12 B. Private 42020, 7th Battalion, Norfolk Regiment. Killed in action 24th August 1918. Aged 18. Born Greenwich, enlisted Whitehall, Middlesex. Son of Alfred and Minnie Susan Sharp, of 53, Manilla St., West Ferry Rd., Millwall, London. No known grave. Commemorated on VIS-EN-ARTOIS MEMORIAL, Pas de Calais, France. Panel 4. Gunner 194987, "B" Battery, 15th Brigade, Royal Hose Artillery. Died of wounds 7th December 1917. Enlisted Woolwich, resident Greenwich. Buried in LE CATEAU MILITARY CEMETERY, Nord, France. Plot V. Row E. Grave 15. Rifleman A/201253, 16th Battalion, King’s Royal Rifle Corps. Died of wounds 16th April 1918. Born and enlisted Greenwich. Formerly TR/13/30605, 110th Training Reserve Battalion. No known grave. Commemorated on PLOEGSTEERT MEMORIAL, Comines-Warneton, Hainaut, Belgium. Panel 8. Sergeant G/484, 7th Battalion, Queen's Own (Royal West Kent Regiment). Died of wounds 5th October 1916. Aged 31. Born and enlisted Greenwich. Son of William and Jane Starkey, of London; husband of Florence B. Starkey, of 20, Glenester Rd, East Greenwich, London. Buried in MONT HUON MILITARY CEMETERY, LE TREPORT, Seine-Maritime, France. Plot I. Row J. Grave 7. Lance Corporal G/4520, 7th Battalion, The Buffs (East Kent Regiment). Killed in action 30th September 1916. Aged 30. Born and resident Greenwich, enlisted Deptford. Husband of Laura Jane Tibbles, of 51, Grenfell St., Greenwich, London. No known grave. Commemorated on THIEPVAL MEMORIAL, Somme, France. Pier and Face 5 D.
Rifleman 6544, 1st Battalion, King’s Royal Rifle Corps. Killed in action 16th September 1914. Born and enlisted Lincoln, resident Peckham, Surrey. Buried in VAILLY BRITISH CEMETERY, Aisne, France. Plot II Row C Grave 2. Sergeant G/5617, 12th Battalion, Duke of Cambridge's Own (Middlesex Regiment). Killed in action 26th September 1916. Aged 30. Born Tonbridge, Kent, enlisted Woolwich, resident East Greenwich. Son of Mr. and Mrs. Luke Turley, of 31, Woodside Rd., Tonbridge; husband of Lottie K. Turley, of 85, St. Mary's Rd., Tonbridge, Kent. No known grave. Commemorated on THIEPVAL MEMORIAL, Somme, France. Pier and Face 12 D and 13 B.
Lance Corporal G/11050, 4th Battalion, Duke of Cambridge's Own (Middlesex Regiment). Died of wounds 1st October 1915. Aged 21. Born and enlisted Greenwich. Son of William Thomas Wade. Buried in PERTH CEMETERY (CHINA WALL), Ieper, West-Vlaanderen, Belgium. Plot XI. Row C. Grave 8. [Listed as 6th Battalion on memorial] Rifleman 376170, 8th (City of London) Battalion (Post Office Rifles), London Regiment. Killed in action 31st August 1918. Born and resident Peckham, enlisted Hounslow. No known grave. Commemorated on VIS-EN-ARTOIS MEMORIAL, Pas de Calais, France. Panel 10. Private P.W.3127, 18th Battalion, Duke of Cambridge's Own (Middlesex Regiment). Died of wounds 25th JUne 1918. Aged 43. Born and enlisted Canning Town, Essex. Husband of Mrs. Whiting, of 47, Mary St., Canning Town, London. Buried in LIJSSENTHOEK MILITARY CEMETERY, Poperinge, West-Vlaanderen, Belgium. Plot XXVIII. Row F. Grave 12. [Spelt WILMOTT on SDGW] Gunner 51775, 21st Heavy Battery, Royal Garrison Artillery. Died of wounds 30th April 1918. Aged 37. Born Idle, Yorkshire, enlisted Woolwich, resident Plumstead. Son of Thomas and Emily Willmot, of Plumstead, London. Awarded the Military Medal (M.M.) Buried in ETAPLES MILITARY CEMETERY, Pas de Calais, France. Plot LXVII. Row A. Grave 14. Driver 17163, 98th Briagde Ammunition Column, Royal Field Artillery. Died in Salonika 5th October 1916. Aged 29. Born Rotherhithe, enlisted Woolwich. Son of W. and L. Winter, of London; husband of R. A. Winter, of 49, Burnt Ash Hill, Lee, London. Buried in KARASOULI MILITARY CEMETERY, Greece. Plot/Row/Section D. Grave 783. Private 8805, 2nd Battalion, East Surrey Regiment. Killed in action 29th September 1915. Born Greenwich, enlisted Deptford. No known grave. Commemorated on LOOS MEMORIAL, Pas de Calais, France. Panel 65 to 67.